The term modern embroidery can mean a lot of things, but it always involves new and interesting styles and patterns. Modern embroidery often includes geometric shapes, simple lines, abstracts, and even a dose of fresh florals. No matter what your personal style is, dive into these modern embroidery patterns and get ready to stitch something with a whole new look. Simple lines and geometry are a hallmark of modern embroidery, and this free pattern from is a great place to start. All you need to know is how to make long straight stitches, and soon you'll have a piece of pretty stitching on your wall. Pumora designs all kinds of modern embroidery patterns, including lots of geometric animals. This horse silhouette design is a different style that's also a classic in contemporary embroidery. Repeating solid shapes creates a bold look that can be adapted to all kinds of projects. As a bonus, this pattern includes instructions for making the pillow cover shown in the example. This gorgeous pattern combines a diamond gemstone shape with a frame of fresh florals—two elements that repeatedly show up in modern embroidery. The juxtaposition of hard and soft lines make this an eye-catching design that will look amazing as wall art, on a tote bag, or even the back of a jacket. If all that fill stitching intimidates you, simply stitch the outlines for a different look that's just as striking. Fruit is a classic motif in embroidery, but this fig pattern by Kelly Fletcher Needlework takes a fresh approach. Part of a series of similarly-styled split fruit designs, the fig half has a fun pattern filling the inside. It's a simple design, and that's what makes it so bold and unique. Succulents are as popular to stitch as they are to grow. This free pattern brings metallics, pastel colors, and geometric framing to the trend. The best part is, you don't even need a green thumb to have your own terrarium filled with pretty plants. 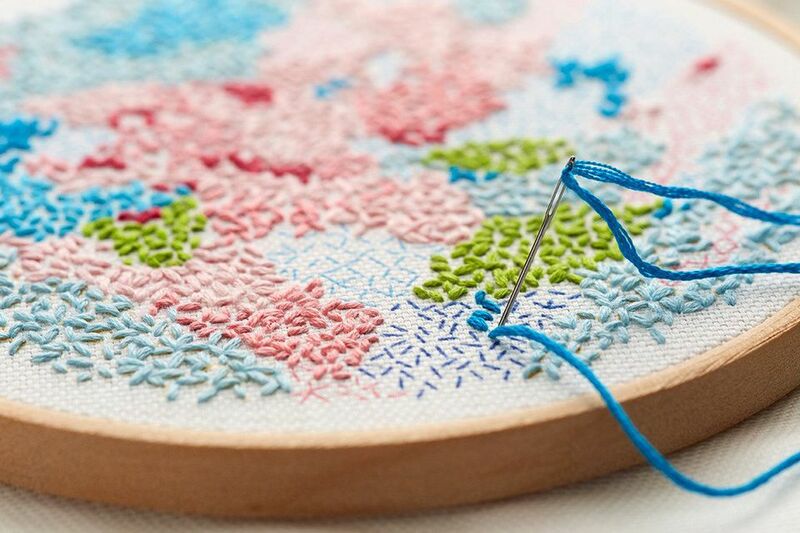 Want to practice new embroidery stitches without making a stuffy sampler? This modern mountain sampler is the pattern for you. The pattern is free, plus you'll have the chance to work on six of the 15 stitches every embroiderer should know. Anne from Lolli and Grace takes what could be seen as a traditional embroidery style, and turns it on its head to make something modern. She shares this brightly colored embroidered tile pattern, along with the instructions for making an ornament with the embroidery. Based on the abstract painting style of artist Belinda Marshall, this beautiful pattern resembles a pastel map worked with tiny stitches. Each simple stitch is like a little brushstroke. Transferring all those little lines could be overwhelming, but since this is a pre-printed fabric panel, you can start stitching right away! This colorful satin-stitched bear from Bustle & Sew has a geometric shape that practically screams modern embroidery. While the lines make the bear more abstract, they have a sense of movement that brings the pattern to life. This pattern is free, but you do need to sign up for the Bustle & Sew newsletter to download it and others. Sometimes modern embroidery isn't just about shapes and styles, but also working on a different or unusual subject matter. This octopus mask pattern definitely fits that description. Anastacia from Odd Ana Stitch fills her Etsy shop with patterns and kits of all kinds, and each one is unlike anything you've seen before. These are not your traditional embroidery patterns.